Look, there is simply no way e-books will ever replace traditional books, printed on paper and bound in cloth. There is something more durable about a real book. Sure, you can burn them, pulp them, and rip them to little pieces. Time and nature yellow and molder pages. Ink fades. But print is substantial in a way that pixels are not. Settle Down With a Good Book: Classics greets you with a selection of electronic books in the public domain—everything from Alice in Wonderland to Hound of the Baskervilles. A Kindle or an iPhone can never duplicate the heft or the texture of a book or the smell of the paper. Is that a fetish? Maybe. But mark my words: When the lights go out for good one day, and phones stop ringing and batteries die and we’re reduced to torch- and candlelight— when the new Dark Age arrives, I’ll be holed up in a mountain enclave surrounded by books, just like the European monks who saved Western Civilization during the Middle Ages. I believe that. Mostly. But Classics from developers Andrew Kaz and Phill Ryu shook my belief a little. It dawned on me the other week, as I spent a solid hour reading—and actually enjoying!—Paradise Lost on my iPhone. I hadn’t read Milton since college, and then it was a real slog. Classics made reading Milton’s epic pleasurable in ways I hadn’t considered or taken seriously before. What good is a gorgeously rendered interface, charming graphics, clever animation if so much of the content is cut off at the knees? As bugs go, that’s a monster. Errors like would put a traditional publisher out of business. Classics 1.1, now available from the App Store, corrects the earlier errors. When you launch Classics, a bookcase appears with books facing outward. Tap a cover and the book opens. Touch and hold a book and rearrange the shelves to your liking (with 13 books, this doesn’t take long). Tap a page and the page flips. You can also drag your finger and the page will turn as realistically as a virtual book will allow. Tap the table of contents button and jump easily from chapter to chapter. A bar at the top of the screen displays your progress. When you’ve finished reading, a crimson bookmark slides down the left side of the page and the book closes. Slick. 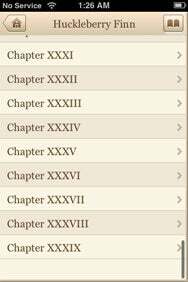 Turn the Page: Tap a chapter on the table of contents page, and you can easily move around a Classics book. Part of what makes Classics so tantalizing is the obvious potential for future expansion. The canon is certainly larger than a dozen titles, and the books included in the app—the unabridged ones, anyway—are a great start. 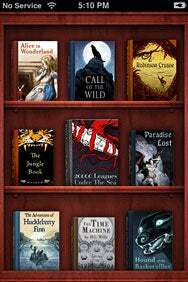 Along with Twain and Milton, you can read Alice in Wonderland, Call of the Wild, Robinson Crusoe, The Jungle Book, 20,000 Leagues Under the Sea, The Time Machine, Hound of the Baskervilles, Gulliver’s Travels, Flatland, The Metamorphosis and, most recently, A Christmas Carol. Considering all the literature in the public domain, Classics has a virtually endless shelf life. I hope the developers will include non-fiction works, as well. Although the text in Classics is easy to read, scalable type and customizable fonts would be useful features. So would a landscape viewing option. As the Classics library expands, there should be a way to remove certain titles from the shelves when memory becomes an issue. For that matter, why not let users add their own books? And I wish there was some way to highlight and annotate text. I’m a marginalia freak, but I bet college and high school students would appreciate such a feature, too. Finally, Classics is a little unstable. The app crashed on me several times, before and after the 1.1 update. But I give Classics credit for accomplishing a feat I’ve never quite mastered over decades of seriously reading serious books: It never lost my place. Classics is compatible with any iPhone or iPod touch running the iPhone 2.x software update.